SV Kids is for children birth through 6th grade. Here we create a fun, safe, and guest-friendly environment for kids and their parents. Whether you like playing with kids, leading songs up front, or working with technology, there are opportunities on the team for every kind of interest or gifting. The SV Students Team builds relationships with students at every stage of life--and they have a blast doing it. If you like high energy environments and like to walk with students as they grow in their faith, check out this team. We believe life-change happens best in community. Our SV Groups Team is made up of hundreds of small group leaders who facilitate conversations centered on God's word in homes throughout the surrounding communities. They also lead groups that help people strengthen their marriage, find financial freedom, or find healing from life's hurts, habits, and hang-ups. The sun never sets on what God is doing through the ministry Sun Valley Community Church. Each year, short-term mission teams bring the hope of Jesus to places throughout the globe. Together, these teams are changing lives and at the same time finding their own lives changed. If you have a heart for those in need locally or globally, joining an SV Missions Team would be a perfect next step. Our Guest Services Team specializes in making people feel welcome. They create a friendly environment and meet the needs of our guests. We want everyone who walks onto any of our campuses to feel like they are our special guests. This team is perfect for those who love being with people and have gifts in hospitality. The SV Tech Team helps create a dynamic, distraction-free worship experience for thousands of people each weekend. If you have an aptitude for technology (sound, lighting, photography, media, or video) and enjoy working behind the scenes with a team, consider joining the SV Tech Team. Training is provided. The Facilities Team cleans, preps, and maintains our buildings and grounds. They keep everything looking and working great. As a team, they set the stage for life-change to take place in our many environments. Campus Safety Team members utilize their experience and training to ensure a safe environment for our guests. They are prepared to address any safety or medical situations that may occur. The SV Music team consists of worship staff members alongside our faithful volunteers who serve from week to week across all of our campuses. Our desire is to help others meet, know, and follow Jesus through authentic musical worship experiences. We strive to create events that are perfect for families and small groups to do together. 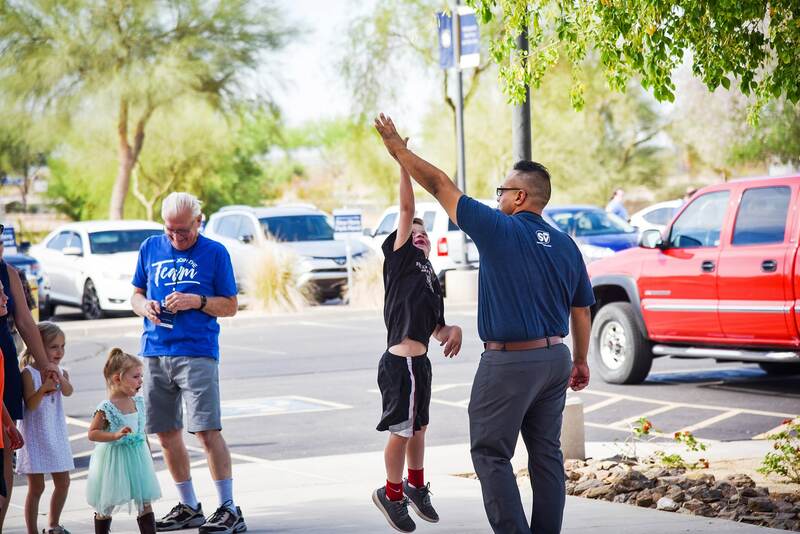 Whether you’re donating food or school supplies, loving on your city through service projects, or saying “thank you” to your local service men and women, you can make a difference through local outreach at Sun Valley.